Kinergy Engineers have led the evolution of the Storage Pile Discharger for over 40 years. Our engineers have been intimately involved with the design, application, and operation of the Storage Pile Discharger since its inception. No other supplier can boast as much expertise in this highly specialized field of Induced Vertical Flow. One of the finest attributes of the Kinergy Storage Pile Discharger is it can eliminate safety hazards when just a vertical funnel flow type of channel (“rat-hole”) only discharges from the pile. When the extent of the “Expanded Flow” has been discharged, the pile is refilled. The peripheral, dormant material is usually left as extra storage and reclaimed only as an emergency supply. When more reclaiming from the dormant portion of the pile is required, a front bladed loader or tractor is often used to push dormant material into a gaping crater. 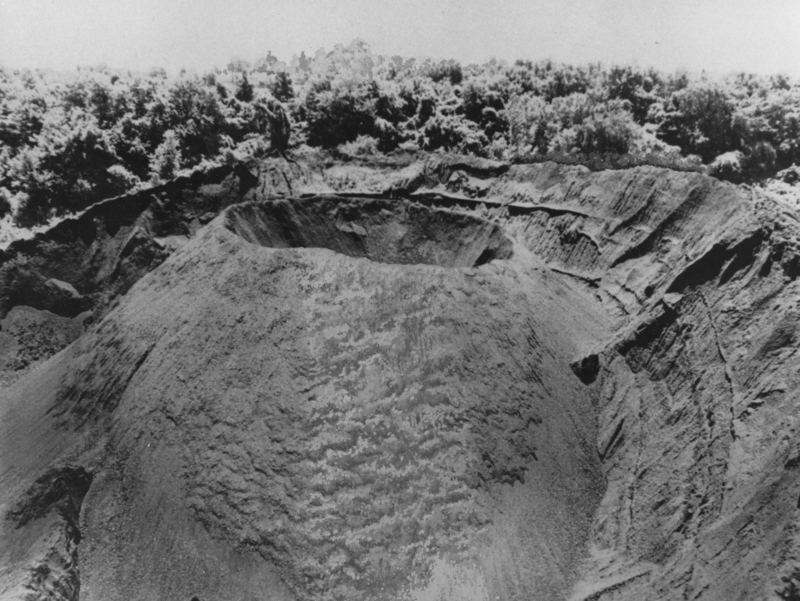 When this happens, the operator risks the danger of a peripheral slough collapsing as the pushing vehicle approaches the edge of the crater. 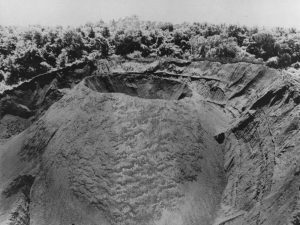 The hazard of the vehicle falling down into the crater along with the huge amount of sloughing material exists and can occur. It was this type of accident back in 1964 that prompted the development of the Storage Pile Discharger. With the use of two rugged Kinergy vibratory motors, Kinergy’s Storage Pile Discharger’s powerful lift-and-twist motion breaks the bonds of even the most stubborn bulk solids that may have taken a strong set or upper layers that are frozen. It also unlocks the interweaving of Flake type materials. Our Discharger generates a uniformly applied symmetrical and concentric type vibratory action that is transmitted up to the top of the pile. The operating frequency and the amount of stroke are selected to penetrate deep into the stored mass. Over the years, our team of expert engineers has designed the optimal Kinergy Storage Pile Discharger to effectively meet our customer’s material handling needs. 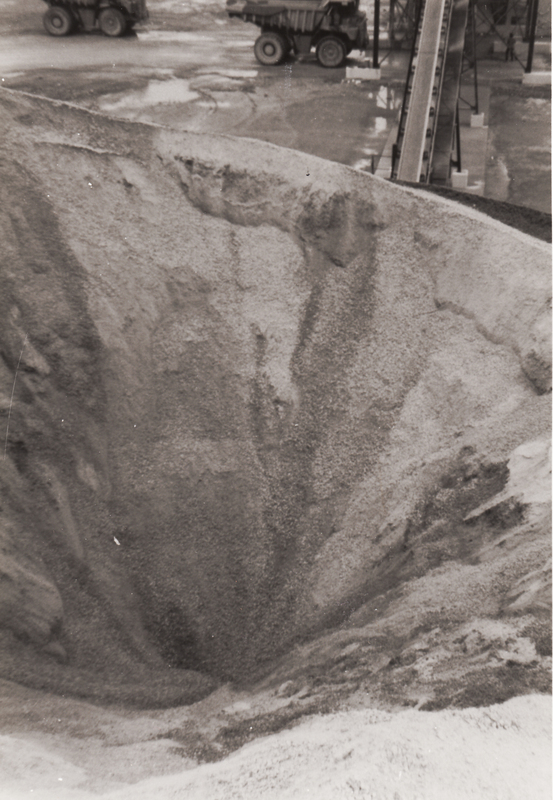 A “Funnel Flow” rat-hole or core over a static port is about to be collapsed by the extension of the “Expanded Flow” crater in this pile where a SPD “Induces” the discharge of -2″ size Steam Coal. The pile was initially 90 ft. in height. 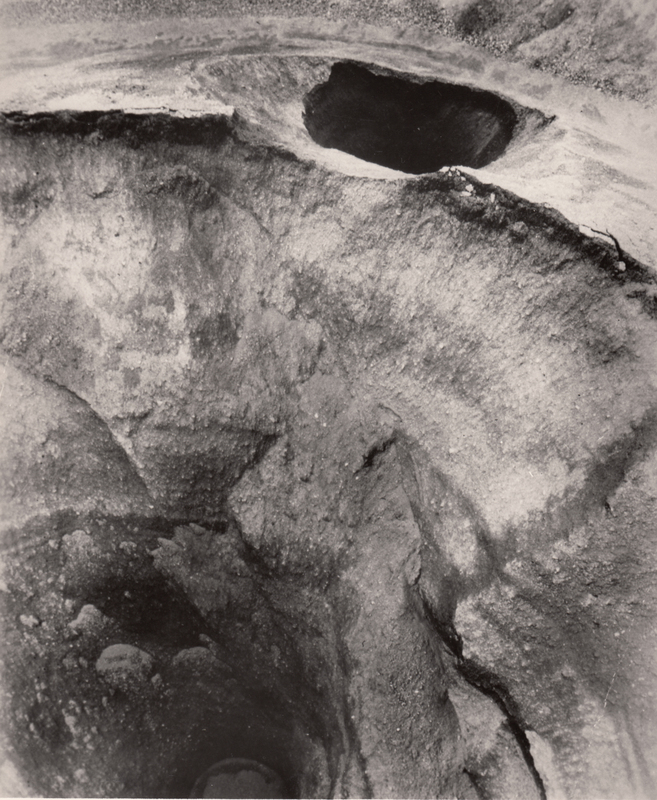 Looking down into the crater of Expanded Flow. Both the size of the pile and the recent rain can be related by noting the trucks and the ground level water puddles standing in the top of the photo. When the upper layers of the pile freeze, the desired Expanded Flow Pattern will still be achieved. Note: The Storage Pile Discharger cannot be seen because it is buried under the pile of limestone; however, its effect on the pile is clearly visible! • Durability: Kinergy Storage Pile Dischargers are built to last with an average of 20 or more years of productive use. • Uniform Slope: The conical transition of the Storage Pile Discharger has a uniform slope of 60° for a favorable vectorial resolution of the material’s wall friction and the force input of the unit when it is on the upstroke or lift portion of its vibratory motion. 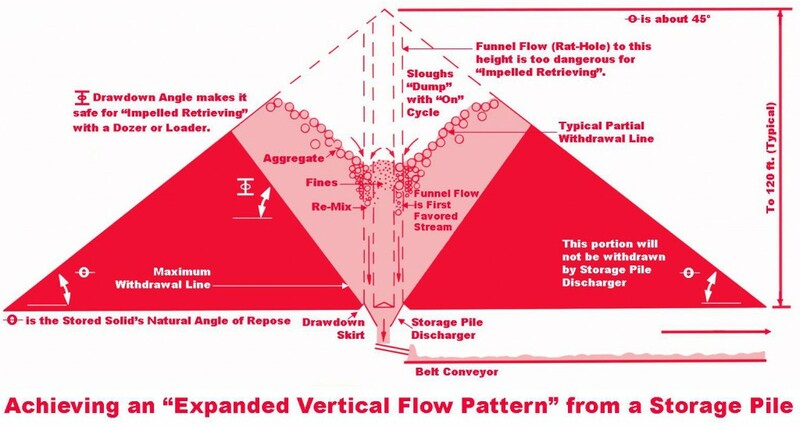 • Safe Reclaiming: The Storage Pile Discharger expands the sloughs of the top layers of the vertical funnel flow (rat-hole) that innately occurs. This makes it safer for reclaiming. • Internal Baffles: The internal inverted cone of the Storage Pile Discharger is the same type of baffle used in Bin Activators. It serves the same purpose which is to cause the full diameter of the unit’s inlet to be the first favored vertical flow stream. When fines inherently accumulate in the center of the pile, they are prompted to remix with the larger size flowing in from the outer edges of the flow stream. • Proven Design: Kinergy purposely designed its Storage Pile Discharger to be concentric and symmetrical to align with the natural phenomenon of the wanted Expanded Flow pattern of the stored material from the pile above. • Reduced Safety Hazard: One of the finest attributes of the Kinergy Storage Pile Discharger is its potential to eliminate safety hazards when contending with a funnel type flow channel (or “rat-hole”) discharging from a pile. • Energy Efficiency: When the pile is to be discharged, the Storage Pile Discharger is vibrated with a cycle type of operation that is automatically accomplished with an electrical timer. Since the Discharger is always operated on a cycle, its power consumption is very low, about one-fifth the HP rating of the motors driving the Discharger. In comparison to the massive function being performed, that’s energy efficient! • Continual Material Contact: Kinergy’s Storage Pile Discharger is equipped with a peripheral rim to ensure the needed sloughing and assures continual physical contact with the stored material. • Variety: Kinergy provides Storage Pile Dischargers with available inlet diameters of 8, 10, 12, and 15 feet. • Low Maintenance: Maintenance is virtually eliminated since the components of a Kinergy Storage Pile Discharger are specifically designed for vibratory service. In addition, there are no internal parts inside the Storage Pile Discharger that require routine maintenance. All that’s required is the occasional greasing of the vibratory motors which are accessible from inside the tunnel. • Various Finishes: Storage Pile Dischargers suffer very little internal wear from the material passing through them even though it may be highly abrasive. However, Kinergy can provide many surface finishes to avoid corrosion over the long term. 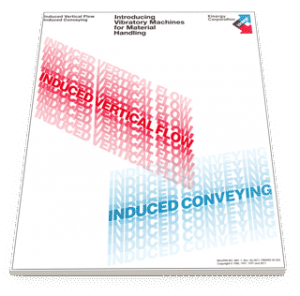 Kinergy Engineers are the experts on the theory of Induced Vertical Flow. We provide the best possible solutions for our customer’s material handling needs. To learn more about our innovative machines, please contact Kinergy at 502.366.5685 or download Kinergy’s descriptive Bulletin KSPD-1 entitled “Storage Pile Dischargers Achieve Expanded Flow”.